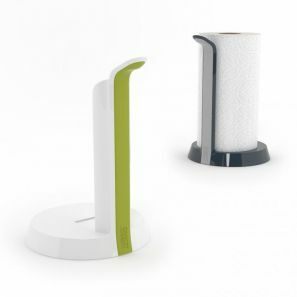 This innovative product makes the task of tearing off paper towels much easier, particularly one handed. The holder incorporates an upright tearing blade that provides a convenient edge against which to tear and its heavyweight, non-slip base provides added stability and excellent resistance when each sheet is pulled. Its self-adjusting mechanism fits a variety of kitchen roll sizes and ensures the roll is always held securely in place no matter how many sheets are left.